The weather’s cold – and if you’re a vintage gaming fan, there’s only one thing to buy – the Pacman Ghost crochet hat and scarf set. 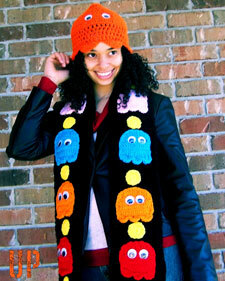 All individually-made by Urban Princess and sold via Etsy, the crochet hat is one-size and the multi-coloured scarf features ghosts with moving eyes. Not the cheapest hat and scarf set – the hat retails for $40 (around £22) and the scarf $150 (around £80), but it’s almost certain that you’ll be only one on the bus in the morning wearing one.